Your home is a place your family can relax, so we understand you need flooring to match your lifestyle. 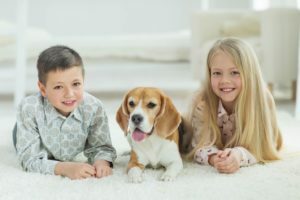 If you’re considering replacing the carpet in your house with different carpet, take a look at some of these frequently asked questions below. How Often Should I Replace the Carpet in My House? Depending on the type of carpet you currently have, it can last for a number of years. However, if you start to notice the padding is getting thinner, matting, or there are stains you cannot remove, we recommend replacing your carpet right away. If carpet is exposed to liquids or a damp environment mold can begin to grow. You should act quickly if you suspect there is mold underneath your carpet. How Long Does Carpet Take to Install? Our team tries to make the installation process as smooth as possible for our clients because we understand you want to have your home back to normal. We will schedule a time that is convenient for you and then place the new carpet exactly where you want it. The length of this process depends on how large the area is that needs the new carpet. When talking with our team, we will provide you with a personalized estimate for your installation. If you have more questions, you can reach out to our team to learn more about carpet replacement in Colorado by calling (303) 788-0113 right now.